In our hectic lives parks and open spaces provide a place of respite and activity, both of which are often a needed contrast to the hardness and urbanity in our daily routines. Parks enhance city life, connect us to nature and the calm it can provide, are a key economic driver, and from the youngest of us to the wisest, give us recreation opportunities that nurture our physical and mental health. Activity, whether playing on a playground or a ten-mile run, and everything in between, benefits our bodies and reduces stress. However, many of us sit at a desk, or in front of a computer screen for eight or more hours a day. Our bodies simply are not built for this. With our increasingly sedentary lifestyle, the Center for Disease Control and Prevention has noticed alarming health trends, with only 25% of American adults engaging in recommended levels of physical activity, and double digit increases in adult obesity. Even more concerning is the trend for our young people— the percentage of children and adolescents considered overweight or obese has quadrupled and trebled, respectively, in the last forty years. Today, children age 8-18 watch TV, surf the internet, and consume other media in sedentary activities 7.5 hours per day, while active play is recognized as an important contributor to the healthy development of young bodies and minds. Not surprisingly, physical access to and proximity to parks has a direct correlation to how a community uses them, and a corresponding health-risk reduction for that community. Parks can make us healthier. Parks can also make us happier. Emerging studies reveal that people’s stress levels fall within minutes of contact with nature, especially coming from contrasting urban environments. In San Francisco, where parks for many are our only, and very best, backyard meeting places, parks also have the ability to bring a community together. And in San Francisco, we are together about loving parks. It seems most everyone enjoys the feel of grass between their toes. (And if you think you don’t, you may have just forgotten.) 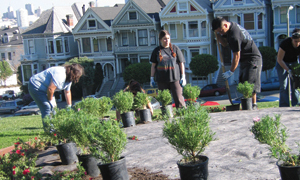 Recent independent polling of residents reveals: 65% polled use their parks one or more times a week, 91% say parks are very important to their quality of life, and 89% say parks are a significant contributor to the City’s beauty and why they live in San Francisco. Our world-class city is blessed with some of the most beautiful parks in the world— more than 350 of them! As much as parks can make us healthier, happier, and as much as we love them, San Francisco’s support of them in recent years has followed a divergent trajectory. From 2006 to 2011, the City’s General Fund support for the Recreation & Parks Department has decreased 25%, while over the same period the City budget and General Fund have increased 23% and 21%, respectively. Less than 2% of the General Fund now supports the parks system— something that 91% of us say is very important to our lives. Cuts to the park system budget have been pervasive and persistent, and even amid economic challenges faced by the City, park system cuts contrast strongly with funding trends for other City departments over the same period. We love our parks, we realize their importance in our lives, yet we do not support them adequately. Are we taking parks for granted? At the San Francisco Parks Alliance, our case for parks contains numbers, statistics, and percentages about why parks are important. But like you, we also experience what is unquantifiable about them. We can’t prove here the power of feeling the grass in our toes, having the space to run, a shaded first kiss or first step, or the solace of a sunlit trail. We won't try. Those memories that parks give to each of us help make our own, individual cases for parks. Go make your own case for parks today.